Listening to music has never been easier. In the age of ubiquitous data and devices, anyone with a phone, a Spotify account and a Bluetooth speaker can get the party started. But it doesn't take an audiophile to appreciate the difference between an ad hoc speaker setup, and a properly-appointed home stereo system. We're not talking about remodeling entire rooms or splurging for the most high-end, high-fidelity gear, but making a few thoughtful purchases, and paying attention to the way sound travels in confined spaces. For all the serious music lovers out there, here are some quick tips for transforming a room into a dedicated listening environment. 1. DON'T BOTHER WITH SURROUND SOUND. Let's start with what not to do, which is to buy too many speakers. Specifically, you only need two or three for listening to music—a right and left channel to deliver stereo sound, and possibly a subwoofer to crank up the bass. That's 2 channel or 2.1-channel, in home audio speak, whereas a full surround sound set might be 5.1 or 7.1-channel. Music is typically recorded and mixed with stereo output in mind, so there's no advantage to adding additional speakers. That's not to say that you can't play tunes on a surround sound layout, but if music is your priority, then focus on getting and placing the best 2 or 2.1-channel gear you can swing. 2. SKIP THE SOUNDBAR, TOO. Soundbars, which squeeze multiple speakers into a compact cabinet, are a popular alternative to the more traditional, multi-speaker setup. 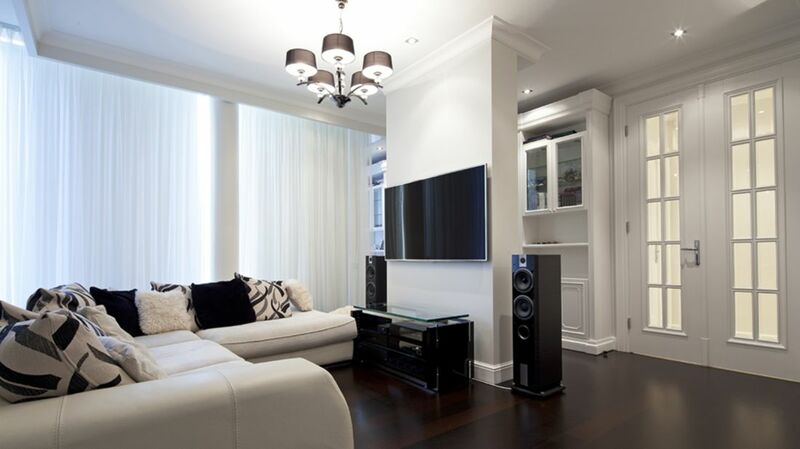 But they're designed as home theater products, optimized for TV and film-based audio, rather than music. And they have superfluous features, too, with most models including a center channel dedicated to outputting clear speech—not vocals, but lines of dialogue. Most importantly, though, is the fact that soundbars don't let you physically separate the left and right audio channels, which brings us to our next tip. Whether it's a concert hall, a rock club, or your living room, every space has an acoustic sweet spot, where listeners can enjoy the full benefit of distinct, directional audio sources. For home stereo setups, the easiest rule is to create an equilateral triangle. In other words, set your left and right-channel speakers at an equal distance from each other, and from you. This will maximize the stereo effect, and avoid any delay or overlap in oncoming sound waves. This might sound obvious, but remember that, while sound radiates outward in waves, most speakers are directional devices, and their cleanest audio comes from waves aimed directly at you. Aiming speakers at your preferred seat will also reduce the amount of audio reflections that you experience (more on that later). This rule only applies to those two primary channels, though. If your system includes a subwoofer, that speaker's placement is less about direction, and more about where in the room its bass sounds best. For subwoofers, trial and error is the more relevant strategy. At their most basic, amplifiers are volume boosters, allowing those without neighbors nearby, or else neighbors they despise, to pour extra power through existing speakers. Amplifiers can work in relative isolation, upgrading the power of speakers, or they can be part of a larger configuration that includes a pre-amp, which can clean up signals before they hit the amp. It's easy to tumble down the hi-fi rabbit hole, however, so consider adding an integrated amplifier to your system, and skipping the pre-amps, receivers, and other arcane gear. 6. PUT BOOKSHELF SPEAKERS ON STANDS. They're called bookshelf speakers, but don't believe the hype. Actual bookshelves can trap and redirect sound, and they can vibrate, creating everything from unseemly buzzing to more subtle audio distortions. If you can't spring for standing loudspeakers, or don't have the space, mount compact bookshelf speakers on stands. 7. CHECK YOUR STREAMING SETTINGS. Streaming music services like Apple Music and Spotify don't generally offer the highest quality files, unless you make the effort to change the settings. Their rationale makes sense—the better the quality, the more data is being transferred per second, which can take a toll on your cellular data plan. But there's usually no reason to throttle your data when listening to music over a Wi-Fi connection, so pick the maximum bit-rate available. Sound waves change as they move through a space, absorbing into some materials and bouncing or splashing off of others. The latter can pose the bigger problem, especially when it comes to audio's interaction with glass. Bizarre as it sounds, you can avoid many unwanted reflections by simply pulling the curtains, or reconsidering that new glass-top coffee table you've been eyeballing. If this seems extreme, know that true hi-fi purists have been known to hang fabric on walls, or else position special, purpose-built audio traps around a listening space. They're the weirdos, not you!